University of Melbourne graduates have designed a robotic arm which aids rehabilitation after people have a stroke. Graduates of the Master of Entrepreneurship are set to revolutionise stroke rehabilitation through an innovative robot, after winning the 2017 Accenture Healthtech Innovation Challenge. Andrew Rowse and Maarten Van Gorp did the Master of Entrepreneurship in 2017, and joined with University of Melbourne PhD student Justin Chun-Mun Fong to create ReCubit. 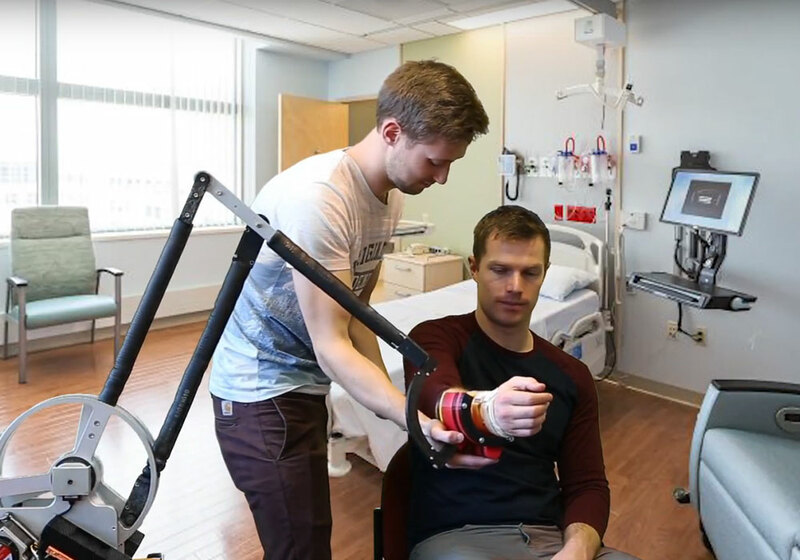 ReCubit is world-first engineering technology using shipping technology principles that enables upper limb rehabilitation for stroke patients in hospital and in the home. “It is fascinating to be able to take technical principals that have been used in ships for hundreds of years, and apply them to an area such as stroke therapy”, says Andrew Rowse, an engineer as well as an entrepreneur. Around 475,000 people across Australia currently live with the effects of stroke. Most stroke patients never recover enough mobility or dexterity to perform basic daily tasks, which is often because they do not receive enough therapy during their post-stroke recovery phase. Maarten Van Gorp also holds a Master of Physiotherapy from the University of Ghent in Belgium, so understands the clinical need for a product like this. “Physiotherapy, like entrepreneurship, is all about clinical reasoning and thinking,” he explains. “You have to keep an open mind, know where the problem lies, and then build a solution for fixing it. With ReCubit we have developed a product that can change the lives of many people every day. The ReCubit prototype device is currently being trialled in Melbourne hospitals, and has strong potential commercial appeal because of its ease of use, affordability and portability. The 2017 HealthTech Innovation Challenge $20,000 prize money from the Graeme Clarke Institute for Biomedical Engineering at the University of Melbourne will allow the ReCubit team to fast-track their market strategy with further research and development trials. “Research is most valuable when it leaves the laboratory. ReCubit is a way to make this transition to commercial viability, and to have a real impact on the lives of stroke survivors in Australia and around the world,” says Mr Fong. 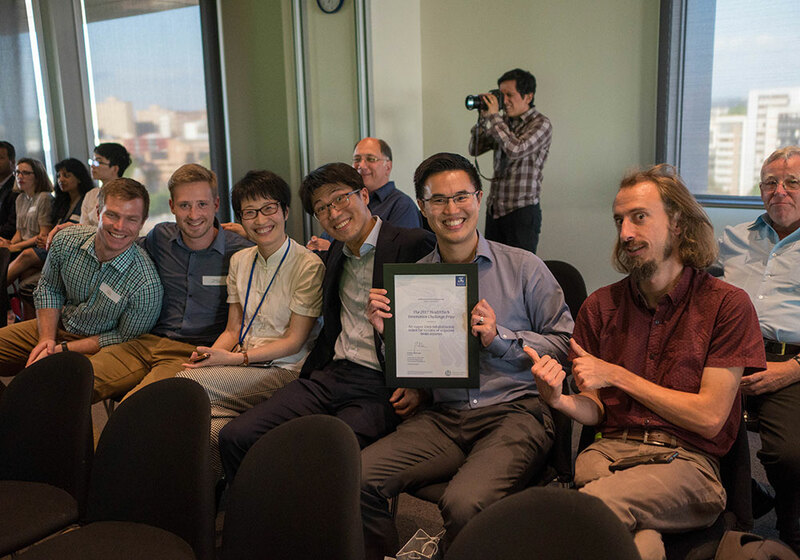 (L-R) Maarten Van Gorp, Andrew Rowse, Dr Justin Fong, Professor Mark Cook, A/Prof Denny Oetomo, A/Prof Ying Tan and Dr Vincent Crocher. The ReCubit team is already kicking big goals, having been accepted as a national finalist in the prestigious Medtech’s Got Talent competition in Melbourne in November 2017, and recently pitching their start-up to a panel of high-profile investors at the University of Melbourne’s Wade Institute Showcase Pitch Night where they took out the MYOB People’s Choice Award.